6 bedrooms, 4 baths, sleeps up to 12 people- includes pool access and is less than one mile from beaches of Lake Michigan! New construction- exterior will be similar in design and the same color. Street view of property progress as of Feb. 1, 2019. Construction to be completed by May 2019. Kitchen- new construction will have similar finish levels Kitchen- new construction will have similar finish levels Kitchen- new construction will have similar finish levels Living Room- new construction will have similar finish levels Master Bedroom- new construction will have similar finish levels Master bedroom- new construction will have similar finish levels Master Bathroom- new construction will have similar finish levels Queen Bedroom- new construction will have similar finish levels Laundry Room- new construction will have similar finish levels Reservations include access to the resort`s marina, clubhouse, community pool, and fire-pits. Speed boats, pontoon boats, kayaks, and more are all available for rental at the resort`s marina, adjacent to the property. The Harbor Club Resort & Marina is a quiet developing community with preserved wetlands, natural scenery, and a lovely pond. Beach access is close by in the Aster Pointe Cottage Just 0.25 miles to smaller, more secluded beaches or 1 mile to North & South Beaches. This large, brand new, vacation rental cottage has a completed lower level and is a spacious 3,060sf! It has 6 bedrooms, 4 baths and is finished in a warm and relaxed décor with an open concept floor plan that’s perfect for getting a large group together. 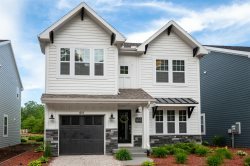 The home features comfortable, quality furnishings, a gas fireplace, a fully equipped kitchen with stainless appliances and an outdoor gas grill, gas fire pit and patio furniture. It also has Comcast tv and WIFI, DVD players, front and back porch, central air, washer/dryer and plenty of linens. There is a conventient and accessible first floor bedroom suite with Queen poster bed, TV, and full bathroom. Upstairs there are 2 King bedrooms and 2 guest rooms that each have 2 Twin beds, plus 1 Twin trundle (for a total of 6 Twin beds upstairs). The expansive Recreation and Game Room on the lower level includes; a modern electric fireplace, large screen TV, ping pong table, a Queen sofa sleeper, and games. A sixth guest bedroom and full bathroom are also in the finished lower level. The back yard features a gas fire pit, which requires no firewood and is smoke-free- for a clean and convenient "campfire" experience! A gas grill and outdoor dining space are also provided for your group to further enjoy being outside together! The flexible lay out allows the home to sleep up to 12 guests and the home is perfectly equipped for large families or groups of couples! Located in the Harbor Club of South Haven Resort & Marina, the cottage includes access to the Woodland Harbor Marina, Resort club house and outdoor heated pool. The closest beach is a small public beach. It is just a 15 minute walk away and a little more secluded than the busy primary beaches. The Resort community is about 1 mile from downtown South Haven. -Family Recreation & Game Room with ping pong table, fireplace, and more!